The more I think about its name, the more it makes sense to me that Ark is doing its darnedest to patch in every animal under the sun plus some extra ones that take its fancy. And the more I think about the latest addition to the menagerie, the worse an idea it seems to put beavers on a wooden boat. 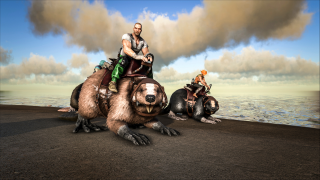 Castoroides are giant, rideable beavers. They can chew down and collect enormous volumes of wood like fluffy lumberjacks, but unique to the beaver, they can dam rivers, making territorial control that much easier. They're also handy amphibious mounts. Studio Wildcard is also trying to spice up player relationships. Handcuffs are now in-game, helping you keep prisoners compliant or just screw with new spawns you find out in the wild. Expect a new wave of sadistic videos to hit YouTube any moment now.